I am a behavioral ecologist interested in the effects of stressors on freshwater systems. In particular, my research explores how predators shape the behavior of individual prey and the long-term consequences of these behavioral modifications. In my current position with Dr. Dennis Murray at Trent University I am concurrently working to better understand the physiological mechanisms underpinning amphibian responses to stress and helping to develop a new online graduate program in Environmental Monitoring and Assessment through eCampusOntario. My PhD work examined the carryover effects of tadpole experiences with predation risk across anuran metamorphosis – that is, how tadpole experiences with predators shaped their behavior and morphology after metamorphosis. Although metamorphosis is a dramatic morphological and physiological revolution for frogs, the plastic modifications that frogs make while tadpoles in responses to predation risk have long-lasting effects on frog size, shape, and behavior. 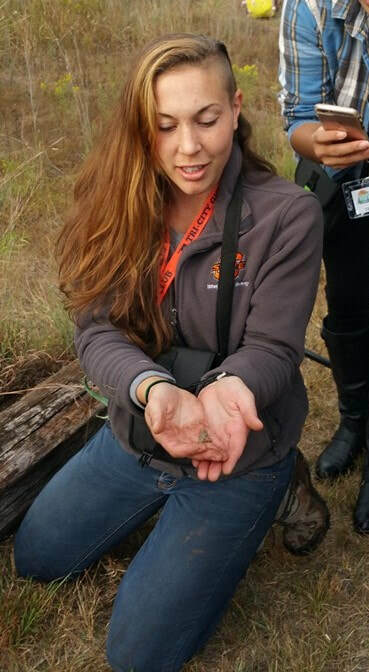 In my Masters, my research used both theoretical and empirical work to examine the role of individual variation in frog population dynamics and behavior. Together, my PhD and Masters work show that experience with predators influences the degree of phenotypic variation within- and between- individual frogs and across life stages. This finding has implications for our understanding of the influence of ecological processes on evolutionary dynamics and highlights an important link between aquatic and terrestrial ecosystems. Beaty, L.E., K. Nyarko and X.E. Bernal. (2015) Does light reveal their true toxicity? Light-induced changes in coloration through ontogeny in cane toad tadpoles (Rhinella marina). Herpetological Journal. 25(3): 191-195. Beaty, L.E. and C.J. Salice. (2013) Size matters: Insights from an allometric approach to evaluate control methods for invasive Australian Rhinella marina. Ecological Applications. 23(7): 1544-1553. Beaty, L.E. and S. Beaty. (2012) Bufo marinus (Cane or Marine Toad). Crocodile Predation. Natural History Notes - Herpetological Review. 43(3): 471.